College life can be stressful at times, filled with academic and social pressures. After all, expectations are high, and perfectionism is rampant. With activities and lectures filling your daily routines, it may appear that there’s not enough time in a day. However, consider for a moment what you’d do if you had a few extra hours per week. Would you take some much-deserved downtime, have a fun night out, study a little more, or maybe earn some extra cash? Well, you can have those extra-hours if you learn the trick of maximizing your productivity. 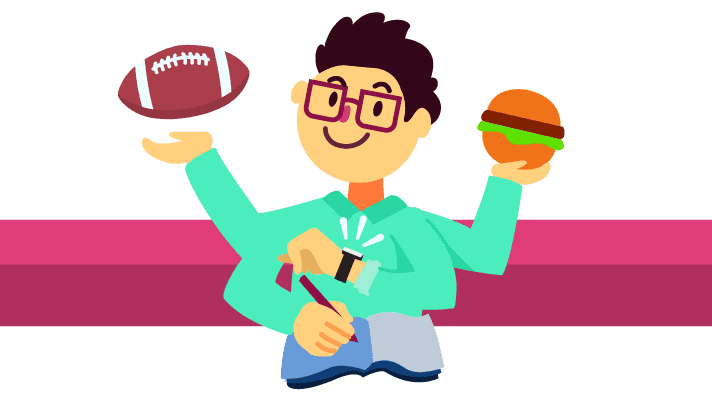 Using your time smartly and strategically is the key to cracking the college experience, earning more time to do the things you love and still, acing your classes. By using productivity data insights from researchers and scientists, you can learn how to manage your time better while you’re in college. Find out what behaviors and practices can help you hack college productivity. Popular productivity advice often focuses on adopting the schedules of famously productive people. It’s enticing to think that if you woke up at 6am as Steve Jobs did that you’d be building a company such as Apple. However, the data shows that you shouldn’t mirror your schedule to that of Steve Jobs. Nor would it help your productivity to start a pre-dawn workout as The Rock does, take a midday nap as Charles Darwin did, or sleep only four hours per night as Martha Stewart does. Instead, following your own circadian rhythm is the key to being productive. Whether you’re an early bird, a night owl, or somewhere in between, developing a routine that’s natural to your rhythm is the best way to optimize your wake-time hours. Majority of college students tend to be out of sync with their biological clocks, said an analysis about social jet lag from UC Berkeley and Northeastern Illinois University researchers. Early hours are often a struggle, and 50 percent of students take classes before they’re fully alert. For some students, their schedule is misaligned in the other direction, and 10 percent have already peaked before classes start. Only 40 percent of students have a class schedule that’s in alignment with their biological rhythms. The alignment of your class schedule to your physiology has a direct impact on your grades. The worst average GPA occurs when night owls take morning classes. On average, night owls see the most impact from taking classes outside of their natural patterns, and they’re more likely to defeat themselves by taking more morning classes than the other two groups. Consider ways you can construct your daily schedule to optimize performance. First, your sleep schedule has an impact on all aspects of your day, including your class performance. Unlike the popular myth that the early bird gets the worm, productivity isn’t improved by when you start your day, but by how you use your time. Be consistent about your own sleep patterns by going to bed and waking up at approximately the same time every day. This regularity has a surprising effect on grade performance, and researchers found that a 10 percent increase in the stability of sleep/wake times increased GPA by 0.10. The second major aspect of mastering your time involves taking a close look at your class schedule. On average, evening classes had a 0.27 point higher GPA than morning classes. Although the cause of this is unknown, data indicates that it’s because evening classes are in better alignment with college students’ circadian rhythms. It’s also been found that students’ grades are higher when classes meet more often. The lowest grades were in classes that met once per week. Classes meeting two or three times per week had slightly higher grades, and classes that met four times per week had significantly higher grades. Instead of trying to run 10 miles before 5am, consider a more realistic approach to improving productivity. An analysis published by the Harvard Business Review identified characteristics of super-productive people (those that ranked in the top 10 percent). These time management hacks are reasonable ways to start achieving more and to make better use your time. #1. Begin: Starting can be the hardest step, but procrastination can lower grades. The Hechinger Report found that students who waited until the day before an assignment was due scored 3 percentage points worse than class averages. All other groups scored higher than class averages, with students that started two days before the deadline scoring slightly above average, and those starting earlier scoring significantly above average. #2. Set Stretch Goals: Striving to achieve ambitious and challenging goals can help you accomplish more than you otherwise would. Be deliberate about setting appropriate challenges, and avoid the stretch goal paradox by understanding the context and capacity of what you’re trying to achieve. #3. Be Consistent: A steady and productive rhythm gets more results than the ebb and flow of goofing off and all-nighters. #4. Collaborate: The most productive people work well with others, and do so often. #5. Manage Information Availability: Searching online for information and tutorials kills productivity. Consider using the homework help app, Solvit, to get answers quickly without the Google timewarp. #6. Be Results Driven: Check things off your to-do list. Push for new accomplishments. Compete for new personal bests. #7. Problem Solving and Problem Avoiding: Productivity roadblocks are inevitable. Use innovative strategies to steer your back into the right track instead of avoiding the problem. Whether you’re in the classroom or studying before an exam, using productivity hacks to learning can help you save time and improve grades. Participating in class, whether it’s raising your hand, engaging in class discussions, or listening attentively, constitutes active learning, which improves grades by 6 percentage points. That’s the difference between a B+ and an A. Interestingly, low-GPA students see the biggest impact from active learning techniques. If too much of your class time is spent taking notes to capture what the professor is saying, you can hack your education by downloading crowd-sourced class notes from OneClass. This will free you up from note-taking so you can be better engaged during class. To be more effective when working on your homework, incentivize yourself. In fact, 22 percent of those aged 18-24 would be motivated by a reward. In one possible scenario, you could reward yourself with 10 minutes of YouTube after each hour of studying. Another possibility could be one bite of candy for every paragraph you read, as seen in this classic photo of using gummy bears to help motivate a student to read a textbook. Another learning hack is to use a technique called chunking. By breaking up big concepts or long strings of information, it’s easier to remember them. For example, the text string “7133224754” is hard to memorize, but an easier option is (713)322-4754. Chunking can be applied to individual memorization points, to concepts, or to the material for a final exam. Learning smaller segments at a time will make your studying more effective. It may seem counterintuitive, but strategic renewal improves productivity. Take some down-time, and make time for naps, workouts, daydreaming, and vacations. It’ll be good for your grades. Find out how OneClass can help you study smarter with online class notes and custom study guides.